The Congress party has never left any opportunity to criticize Modi government. On Monday, the party has continued to make an offensive remark on Prime Minister- led government at Centre over Rafale fighter-jet deal and keep on saying that is really hard to track the lies of the government. The controversy over Rafale deal takes no name to stop as the new angle has come to light last week after the former French president Francois Hollande said that the Indian government proposed Reliance Defence’s name as the offset partner for the Dassault Aviation. Rahul Gandhi’s party demanded the answer from Prime Minister Narendra Modi over this scam and also said that the government is lying over the issue, be it is Finance Minister or the Defence Minister. 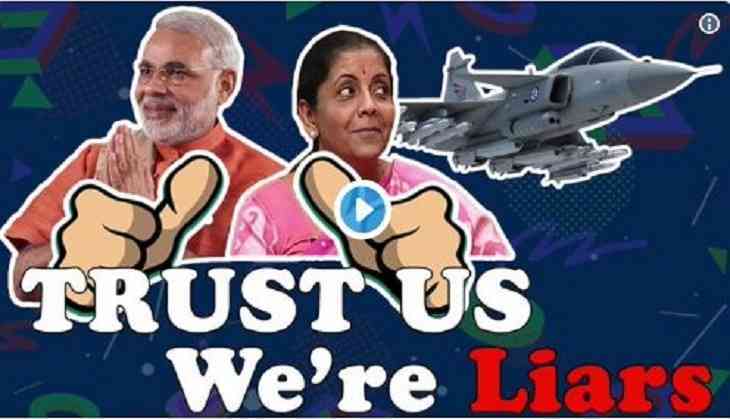 Even the grand-old-party has also taken the fresh jibe at Defence Minister Nirmala Sitharaman over her statement on Rafale and also made a video which they shared it on Twitter with a hashtag #ChorPMChupHai. Earlier, Defence Minister Nirmala Sitharaman also took to Twitter and said, "They betray their sense of desperation in being out-of-power. In our govt there is no corruption. No wonder today the buzz is #RahulKaPuraKhandanChor."